The tips I am including are all about creating the most vivid and gorgeous colors possible and making your posters durable! 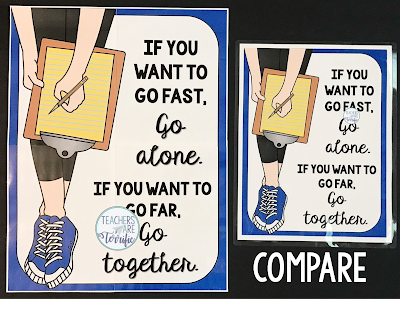 I don't know about you, but I want items to last- for more than one school year! Number 1 Tip: Use a good quality paper! Regular copy paper tends to soak up the ink and the colors will never be bright. Cardstock is a good choice, but it also soaks up the ink. I also find that some printers do not pull cardstock through the process evenly and you may get a wonky poster. Use a heavier weight of copy paper - like a 24-30 lb. with a high brightness level. The best paper I have ever found for posters is from Staples- Premium Color Laser Gloss paper, 96 bright and 32 lb. Posters print beautifully on this paper. But, be cautious with the glossy paper. The ink does not dry as quickly and will smear easily. Do You Have a Good Printer? This is the printer I have and it has been a great one! It's the HP Office Jet Pro 8710. I love this one because it is wireless and it prints fast! It makes copies and scans. I also use the Instant Ink program which means you pay a monthly fee for the number of copies you think you will use. When your ink begins to run low, HP automatically sends you a new box. It arrives before you run out of ink. You recycle the used cartridges and keep printing. So, what's the tip? I am much more likely to print color pages because of this printer and the ink program. The colors are vivid and bright! Trust me: I print every poster set before uploading it to my store to make sure the colors work well, so having a great printer solution is a big deal! If you are interested in the Instant Ink program (you have to have an HP printer) here's my affiliate link: INSTANT INK By using the link you will receive a free month! If you are not interested in purchasing a printer to use at home, you can also get an office supply store to print posters for you. This adds to the cost of the posters, but they look fantastic! Yes, you should laminate your posters. Of course! I know you already know this- laminating makes items last! Do you use a school laminator? I do sometimes, but never for my poster sets. Therein lies my tip. If you are laminating brightly colored posters don't do it at school! I can't tell you how many times the school laminator has wrinkled or ruined something I was feeding through. I have a personal laminator at home and it works great! The lamination is a heavier plastic and trims well- if you need to do any trimming. Hanging in a Line (that is not crooked)! I learned a long time ago to not try to make the letters on my boards in a straight line. I almost always make each letter turn a little- so the crookedness is much harder to detect. I actually love making bulletin boards! But, I also like for things to match. So, how do I get the letters and borders and decor to match? I start with the border! Then I find colored paper to match the colors of the border and make the letters from the paper. I also have a big bin of pom-poms, tissue paper, banners, large fans, and more. From that bin, I choose some decorative items in the same colors and BAM I have a well-coordinated board. My tip is to save all those items when you pull them off the board and reuse them later! 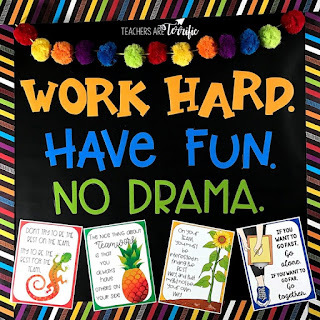 Tip #2 - I never staple decorative items or posters to bulletin boards. Eventually, the board has to come down and I find the staples much harder to remove and sometimes I will tear something that I wanted to save. I use pushpins instead! I love this display in my library at my house. I printed one of my Harry Potter posters in a smaller version to fit in a small picture frame. Use the settings on your printer to print things smaller! 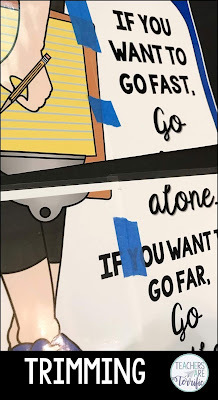 Tip: If you decide to try printing smaller, print the first item in black/white to make sure it works for your frame or wherever you plan to put the poster. I had to adjust the size of the poster in my frame several times before I got it just right. So, I am often asked what size my poster sets are and the answer is 8.5 x 11 inches. However, sometimes you want a larger poster. So, I have created the steps below to show you how to do this! 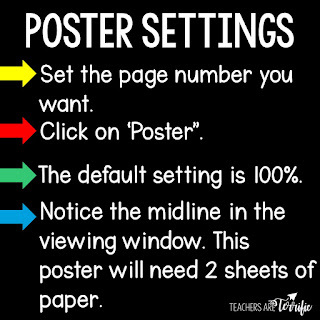 This works when you have a poster resource that is saved as a PDF. Yes, check the orientation! I have printed several items in landscape when it should have been portrait and it is such a waste of ink and paper! Check this orientation!! 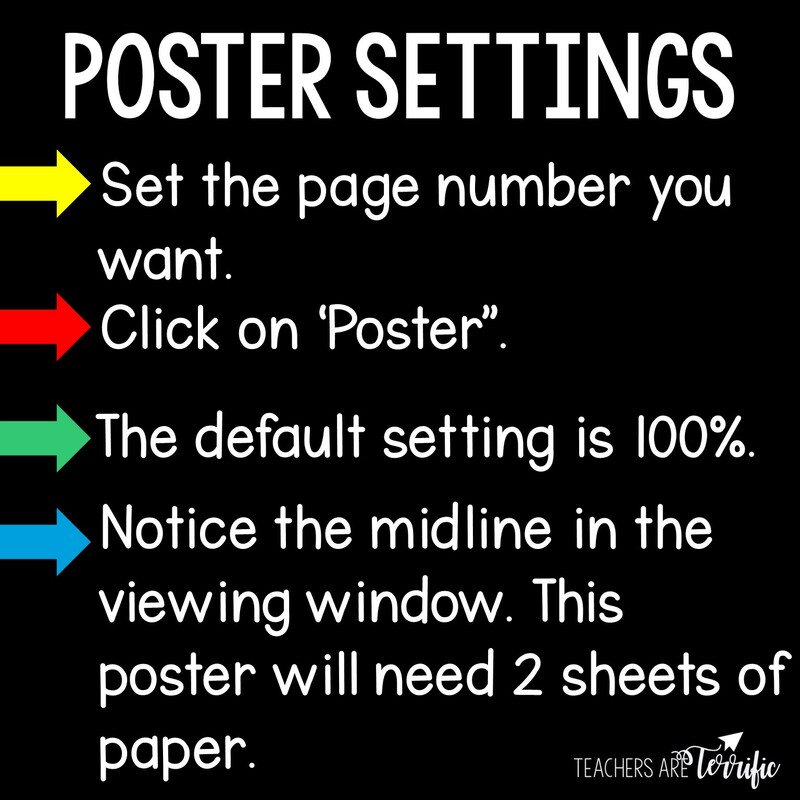 The next set of directions will show you how to make a larger poster! Look carefully at the viewing window above. 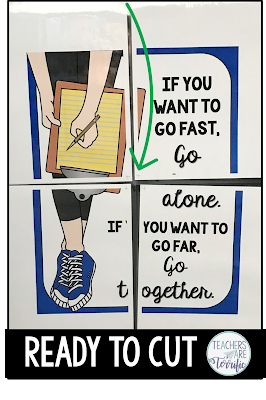 Even though this one uses two pieces of paper, the size of each half does not fill the page- meaning this poster will not be any larger than normal. You want the poster pieces to fill more of the white space. Below is an example of a larger poster. I changed this one to 120% and you can see how much more space is filled. It still uses 2 sheets of paper. Need it even larger? Check the one below! 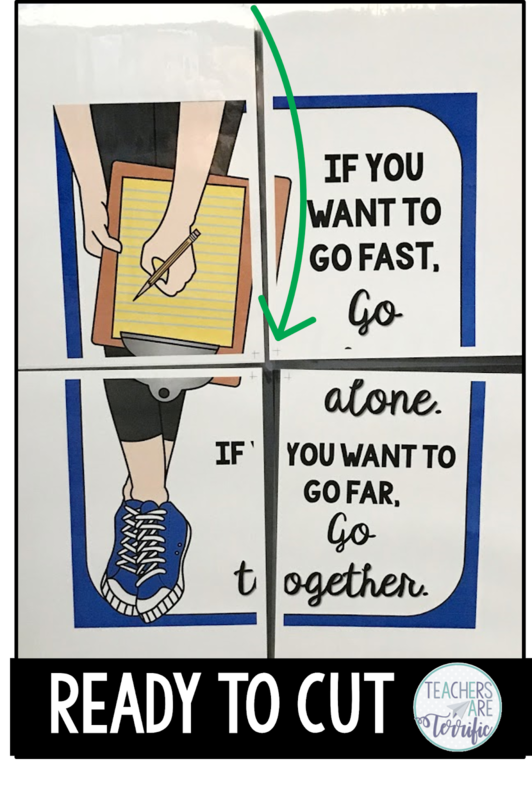 This poster is enlarged to 200% and this one will take 6 pieces of paper. So, after printing the sheets of the poster, what is next? Next, the pieces must be taped together. I overlapped them carefully and used painter's tape to hold them in place. Then I flipped the whole thing over and used clear tape to tape the pages together. Just to show you how much this was enlarged I made a photo of the enlarged one beside the original. I did leave a white edge around the outside- just my preference. A final tip about enlarging: If you try enlarging a page I would suggest you change the percentage to something that will only use 2 pieces of paper. Lining up the edges for 4 sheets and getting them taped in place is harder! Have fun printing your posters and I hope my tips will save you time and money (by not wasting paper or ink)!